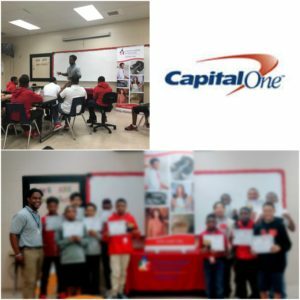 Communities In Schools of Southeast Texas sends a big THANK YOU to Capital One for the donation of $1000 for our Vector Program. Vector is a CISSET program focusing on character enhancement for young male students on our Beaumont and Port Arthur CIS campuses. The program is facilitated by Mr. Williams and/or Mr. Rhodes. Pictured: Marshall Vector Program with Mr. Williams.